The Medicine Cards referred to in this story are by Jamie Sams and David Carson, published by Bear and Company, 1988. When Violet disappeared, I did what everyone else does - I panicked. I wrote this true story in December, 1999. The event itself took place in July of 1998, in Violet's lifetime just previous to her current life. Yes, she used the same name. Read about her reincarnation in Violet Returns. As one who works with Spirit and who frequently teach others about animals and their perspectives, I believe I must be a good student. After all, I can only take others over territory I have traveled. So I am open to receiving lessons. Some of my lessons are easy to learn. Others are designed to accelerate me along my path and are more challenging. On Friday evening, July 17, 1998, I returned from a 5-day vacation at a spiritual center in the Catskill Mountains in New York State. 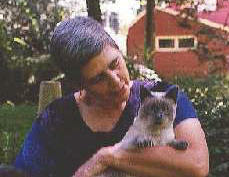 Violet, my blue-point Siamese companion, looked well cared for and healthy. Still, something wasn't quite right. When I asked, "Are you OK, honey?" she said she was fine, but it didn't ring true to me. I knew she hadn't been allowed to go outside in my absence, and I suspected she was a little upset about that. I decided to return to our normal routine and let her outside during the day whenever I was at home. On Saturday, I had many errands to do, but I also made sure Violet opportunities to go out. That evening, I stayed only briefly at a party so that I could spend time with Violet. She seemed rather distant that night, but I told myself it would pass. The next day I attended my regular Sunday morning meditation group, arrived home at 11 a.m. and opened the sliding door for Violet . I explained that I had to leave around 12:30 to teach a class and asked her to please come in by then. I didn't hear a response and assumed that all was well. Violet always honored my requests for her return, frequently coming inside a few minutes before I needed to leave. This day was different. This day, when I was ready to leave and called Violet, she didn't come at all. Instead she announced that she wasn't ready to come in and didn't intend to come in until she was ready. I couldn't see her anywhere, and I didn't want to be late. Reluctantly, I left Violet outside, telling her I'd be home in about 3 hours. The back yard of our house is small and relatively secluded. There are many trees, a very woodsy area that extends behind my neighbors on either side for quite a distance. Beyond the woods are two tobacco fields and more woods and then houses. There are foxes and deer and wild turkeys, and perhaps even some coyote-canines living there. Violet had been abandoned at about one year of age and survived on her own for 6 months. She had searched through garbage for food and had learned to hunt. At the end of this experience, she weighed only 5 and 1/2 pounds, half her healthy adult weight. When she moved in with me about 2 and 1/2 years previously she hadn't wanted to go outside at all. To help Violet heal from her experience, I encouraged her to explore the area right around the house at her own pace. I would sit in the doorway of my enclosed porch with the sliding door open. If she wanted to explore, I would walk with her. Soon her confidence increased. I would leave her in the open doorway and go about my business inside the house. When she was outside, the door was always open so she could come back inside whenever she chose. This helped her learn to trust that I would never abandon her. That Sunday, as I drove away leaving the sliding door open, I asked my guides and the Nature Spirits of the property to take care of Violet and of the house. I arrived home around 4:30 p.m. as promised, expecting to see Violet sitting on the back steps like a lioness surveying her domain. Violet wasn't there. I called her name aloud. No response. I called her name telepathically. She said, "I'm not coming in yet." "OK", I replied, trying to be calm and nonchalant. "What do you want for supper? I'll start defrosting it." But Violet didn't come home that night. I asked when she planned to return; her reply was "soon". Although I'm a professional Animal Communicator who is supposed to know how to take all this in stride, I started to blame myself for Violet's decision to stay away from home. I began to review all the arrangements I had made for her during my absence. I recalled all the times I had "checked in" with her while on vacation, giving her hugs and receiving purrs and snuggles telepathically. The feline specialist Pet Sitter had spent an hour each day feeding, grooming, and playing with Violet. Our mutual friend, Sally, had stopped by twice to visit Violet. My mind kept going over and over everything, trying to figure out what I had missed. I could not have stayed home because I really needed the vacation and the time to myself. I didn't feel guilty about having gone, but I was sure I had caused Violet's departure. My mind went in circles. My emotions were also spinning. I needed help. I called Sally, who was telepathic with animals, to see what insights she might have. Sally said that Violet had not played with her and had tried to persuade Sally to let her go outside. Once Violet claimed that she had received a telepathic "OK" from me for her to do so. I heard Sally's remarks as confirmation that Violet was miffed. I asked Sally to check in with Violet when she had time and, if Violet agreed, to let me know what she said. Sally called me back that evening. "Violet isn't angry with you," Sally told me. I didn't believe it. I didn't let myself hear the rest of what Sally had to say. Her words washed past me like a torrent of floodwater. I called Nancie, a friend and a professional Animal Communicator. Nancie talked with Violet. Nancie's information was essentially the same as Sally's, but again, I didn't really take it in. It was a strange experience, to hear Nancie talking and not to understand a word she was saying, as if she spoke in a foreign tongue. On Monday morning, I asked Spirit for an animal guide to help me through the day and chose an animal from the Medicine Card deck*. The card was the Ant. Ant power is "Patience". "Thank you, Ant," I said aloud, and put the card on my alter. I knew I had chosen exactly the right card. When I spoke with Nancie that afternoon, I was still resisting hearing what Violet had to say. According to Nancie, Violet was OK. She wasn't far from the house - could even see the bird feeders - but wasn't coming in. Violet insisted that she wasn't angry, and Nancie could feel in her energy that she wasn't angry. I kept insisting that Violet had to be angry. Finally, Nancie spoke sternly to me. "Listen, Nedda, you've just GOT to clear up your energy. You're NOT hearing what Violet is saying. And until you can hear it, she isn't going to tell me what's going on." "OK," I said, feeling quite deaf as well as frustrated and trying hard to hear past my internal resistance. "I'm not angry with her," I insisted. "I just want her to come home." As soon as I hung up the phone, I realized that I WAS angry and was projecting that anger onto Violet. "After all I've done for her, " was the thought that gave me insight into my emotions. I was startled as well as embarrassed to hear myself thinking thoughts that do not fit with my ethics and beliefs. Violet didn't owe me anything. I had done for her what I wanted to do. I had given to her freely and she had given back to me as much as I had ever given her. Now I knew I had to clear my anger and I began to pray and ask for guidance and help. On Tuesday morning I asked for an animal guide for the day and choose the Weasel Medicine Card. The word "weasel" has negative connotations, but I pushed that notion aside and read from the book that came with the Medicine Card deck. Weasel represents "Stealth". My own ego had tried to trick me, but now Weasel was going to help me. "Weasel ears hear what is really being said.... Weasel eyes see beneath the surface of a situation to know the many ramifications of an event. This too is a rare gift." "Thank you, Weasel." I put the card on my alter. When Nancie and I talked on Tuesday, she told me she had done some Shamanic work to clear the energy between Violet and myself. My prayers and meditation had cleared my personal energy. I was ready to listen and to hear. In Nancie's next conversation with Violet, my feline friend was more open. Violet explained that when I had returned from the mountain retreat, my vibrational rate had been raised so high she found it uncomfortable to be in my energy field. She knew she had to raise her own vibrations to continue living and working with me. Her spirit guides told her to spend time in the woods on her own to shift her vibrational frequencies. This time, I heard what Nancie said and it made sense to me. Violet was not sure how long it would take her to complete her task. She promised to come home as soon as possible. Later that day I spoke with Violet myself. I told her I respected what she had to do, and that I loved her and missed her. I reassured her that this was always her home for as long as she wanted to live here. I promised to keep the door to the porch open in anticipation of her return. I asked if she wanted to know of my comings and goings, just as if she were home. Violet said that she did wanted to know my schedule. For the first time since she had left, I felt her telepathic snuggle and heard her telepathic purr. She was greatly relieved that I had accepted her decision and respected her choice. During the week, when friends asked about Violet, I told them she was on "vacation" or on "a spiritual retreat." Clearly it was inaccurate to say that Violet had "run away", so I eliminated that concept from my thinking. On Wednesday morning, the Medicine Card was Antelope. Antelope represents "Action", the kind of action that is really "service to others". Ironically, my time at the retreat was focused entirely on "seva" or self-less service. I wasn't sure how to apply this concept to my situation with Violet, but I was open for the day to reveal the meaning. When I picked up the card to put it on my alter, I discovered that there was another card stuck to the back of it. 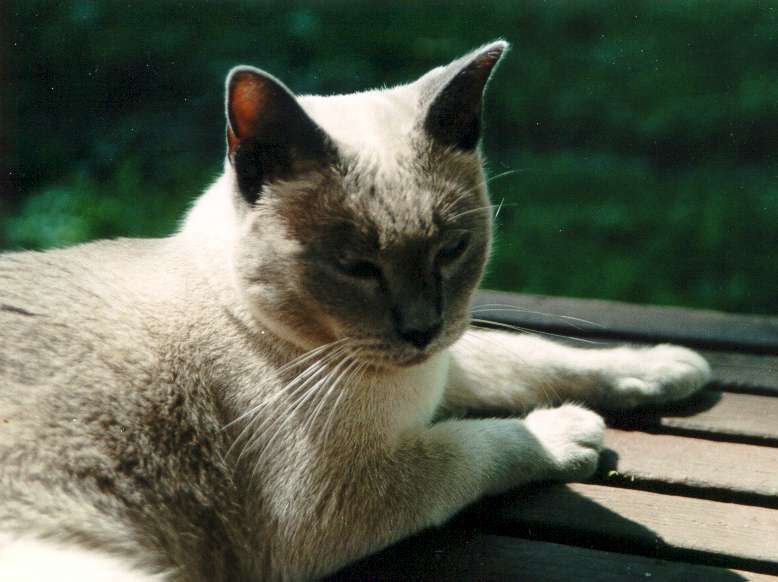 The second card was a blank one in the deck on which I had previously pasted a picture of a blue-point Siamese. I put both cards on my alter, feeling that my service to Violet was my total acceptance of her right to be in charge of her own life. Later that day, I told Violet my schedule and asked how she was doing. She said, "You should have taken me on the retreat with you. Then I wouldn't have needed to do this." "I wish I could bring you there, Violet, but it's against the rules." "Well, I'd like to meet Gurumayi," she said, speak of my meditation Master. "I can send a picture of you to her, if you wish, but you'll have to come home so I can take the photo." Then I realized that I could introduce Violet and Gurumayi telepathically. I sat quietly for meditation. I went into my heart center, and made the introduction. I saw Gurumayi sitting in lotus posture on her chair, with Violet sitting on her haunches in front of Gurumayi. Gurumayi tapped Violet on the head with her peacock-feather wand, and sparks flew as Violet was surrounded in light. Violet had received spiritual initiation. She was in an ecstatic state and not available for conversation. I gave thanks for this great blessing and went about my day. Thursday, July 23, was an auspicious day. For one thing, a powerful 5th dimensional vortex of energy was scheduled to open between the Earth and Sirius to make higher vibrational frequencies available to the Earth. I awoke that morning filled with expectation. In a dream, Violet had told me she was coming home this day. Sure enough, when I contacted her telepathically, she was singing and full of joy and energy, promising that she'd be home. I became filled with anticipation. My animal guide from the Medicine Cards that day was the snake, Kundalini, herself. Around noon, a dramatic thunder storm came through from west to east. When I heard the storm approach, I told Violet I hoped she would find a dry place. She didn't respond, and I sensed she was looking for shelter. The thunder rolled on and on and on, right over my house. The lightening seemed to be everywhere. The rain was intense, several inches falling in less than an hour. At 4 p.m., I heard Violet's voice, her sound that announces she has a gift to share with me (mouse, mole, chipmunk, or toy). I jumped up, calling her name. Violet wasn't in the house. I went outside, continuing to call for her. My neighbors to the south asked if my cat was missing. "Not exactly," I replied. "She is out here on vacation for a few days. I think she's on her way home and I thought I just heard her call." "Oh, I wish we had known you were looking for her," they said. "Just as the storm began, some guests of ours saw her in our tool shed." But Violet was not there now, and between the neighbor's shed and our yard were several inches of standing water. "Oh," I sighed, "Violet was so close. She was probably trying to follow her trail home, and now it's all under water." I tried to tell Violet how to get home bypassing the water, but she seemed confused by my instructions. Violet insisted that she would wait for the water to recede. I was very disappointed, but knew she would not wet her paws. Friday morning arrived and still no Violet. The Medicine Card that day was Hummingbird, "Joy". I focused myself on optimism. Just because Violet wasn't here didn't mean she wasn't coming soon. There was a breeze blowing, picking up the water. I silently thanked Wind for helping. The weather report for Friday night forecast a cold front. Violet disliked being cold as much as she disliked being wet. That evening, Violet still was not home. I told her telepathically that I had put her "Cave" on the porch. This is a cardboard box filled with warm things to snuggle into and covered by several wool blankets to hold in body heat. It's her favorite place in the winter when it sits in a corner against two baseboard radiators. On Saturday morning, I jumped out of bed at 6 a.m. and went downstairs to check for Violet. What a relief to find her crystal blue eyes staring up at me from inside her cave. She was filled with gratitude - to be home - to find her cave waiting for her - to be comfortable in my energy as I hugged her to myself and carried her into the warm house. She purred and purred. She had lost some weight that week. Her energy was very refined and light. While Violet was away, each of the animal spirit guides had helped me focus on and understand what I was feeling or what attitude I needed to cultivate to help myself. In addition, a live skunk came to eat under my bird feeder at dawn and dusk from Tuesday night through Friday morning. In my books on animal spirituality, Skunk is said to teach respect for others as well as self-respect. When I asked my visitor for a message, Skunk said it was here to remind me that I needed to "walk my talk", to fully experience an animal (Violet) making choices with which I might not be comfortable and to respect her and her choices. I thanked Skunk, realizing at once that this was the central lesson of the week. The skunk returned for one more meal, and then stopped coming. In our relationships with animals, humans usually feel that we are the ones in charge, making all the decisions. Therefore, when clients call me about "lost" animals, I always explain that animals have their own personal life goals to accomplish only some of which relate to us personally. The animal may not be "lost". The animal may have set out to achieve a particular goal related to their own spiritual development or karma. This does not mean the animal doesn't love you. It does mean that the animal is honoring its own needs and soul purposes. This can be difficult for us to accept, but it is often essential to accept it for our own mental and spiritual well-being. In a relationship based on mutual respect and love, each "person", regardless of physical form, must have the right to make decisions about their own well-being. If we can accept this, we shift ourselves to a higher understanding that will help us cope with our sadness and loss. And when they return, it will bring us to a new level of relationship. When Violet returned, she was content to sleep curled up in the warm house for several days. A little voice inside me asked how I could let her go outside ever again. Still, I knew I would let her go out when she was ready. I would honor her and myself by continuing to treat her with trust and respect.